Kevin Carlson is a highly qualified and experienced Doctor of Chiropractic and has worked in this profession since 1992. He had successful clinics in California, Washington and Vancouver Island in Canada prior to moving to Western Australia. 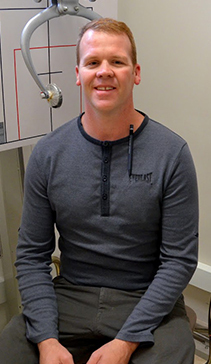 Kevin has established a family clinic in North Perth and offers his patients a range of techniques including a unique method of spinal health care that is new to Australia, but well respected in many countries of the world. He believes many problems originate from the neck, which can affect the spine and cause various symptoms and an array of conditions. The NUCCA method of treatment is a subtle correction of a small misalignment of the upper neck, which restores the optimal balance of the entire spinal column. To read more about how this technique can help you, go to the NUCCA page. Kevin’s approach to his patients is simple. He likes to make as much improvement in as few visits as possible and to help people to take control of their own chiropractic related problems. His nurturing and supportive approach helps to build great relationships with his patients and they trust him to provide the right care.